For the better part of a decade, antibiotic resistance has been serious news. While most people probably don’t know they’re affected by it, a trip to the hospital, a bad accident, or a small, seemingly innocuous red bump can be the beginning of a cascade of superbug related problems. Researchers are thinking outside the box looking for new lines of antibiotics, and it may have been fruitful: they may have found a MRSA fighting bacteria in fish slime. Fish slime is a part of the fish immune system, and just like with humans, young fish are more vulnerable, leading them to produce more of the protective fish slime. Researchers have been sampling fish slime, looking for new ways to battle antibiotic resistance, and have had success. They’ve found strains that can fight MRSA, and others that can fight fungal infections—these could potentially lead to new antibiotics. Even if you avoid unnecessary antibiotics (like for cold, flu, and sinus infections), antibiotics are a necessary part of surgeries and treating some serious infections, making sure we have something to prevent infection is essential to treatment. Unfortunately, because of their common use in hospitals, hospitals are a major breeding ground for resistance. Finding new lines of antibiotics… or alternatives… is urgent. You can protect yourself and make a difference. Choose animal products that don’t use antibiotics as prevention (only treatment). 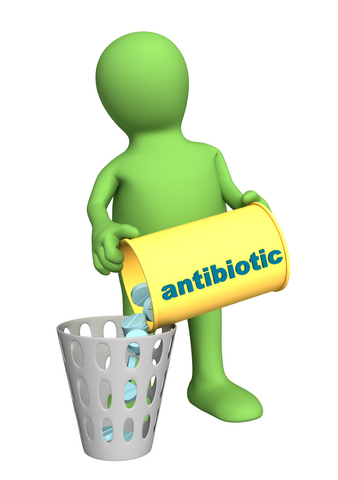 Make sure you have a bacterial infection before taking antibiotics (unless something serious like TB is suspected). Wash and clean thoroughly to avoid making your home a breeding ground for things like MRSA (example: use a clean wash cloth rather than a loofah that can’t be cleaned). For extra immune support, use colloidal silver. Whether used as a daily supplement for all around immune support or as direct support for the skin, research so far has shown it doesn’t contribute to antibiotic resistance.